This week is Climate Week and in recognition of this I thought I’d share some green parenting tips. The great thing about these tips is that as well as helping the planet, you’ll save yourself some money too. The following green parenting tips are by no means prescriptive. The thing I’ve learned most about being a parent is that you have to do whatever works for you. These things work for us – maybe some of them might work for you too, but if they don’t then that’s ok! It is hard being a parent, and sometimes it feels that others are judging you on your parenting decisions (breast vs. bottle; dummy vs. non-dummy; the list is never ending) so the last thing I’d want is for anyone to feel like they’re being judged just because your kid wears disposable nappies or has a thing for plastic dolls! The first of my green parenting tips is to get a head start and start being a green parent before you’ve given birth! Put pride to the side and accept any offers of help. When I was pregnant a friend gave me a load of her old maternity clothes, which was a total life saver, because who wants to buy new clothes that you can only wear for a few months? Other friends gave us their old car-seat, moses basket, steriliser, sheets and toys. My sister gave us a massive bag of clothes from zero months to age three that my niece had long since grown out of. We were amazed and so grateful for all of the help and items given to us. Babies grow so fast, and for the first year especially, babies grow out of their clothes in months, so most of the things were in mint condition. We’ve also saved all of our daughter’s things that she’s grown out of – either for another baby or to give to friends, depending on what the future brings us. If you don’t have any friends or family with older babies/toddlers/kids then mine Freecycle and the freebies section of Gumtree for people giving away baby things they no longer need. You’ll be surprised at what you can find on there! We used washable nappies, and now we’re in the middle of potty training I’m currently using washable training pants. It’s good for the environment, and even though the initial investment is high (we spent £200 on washable nappies) you do end up saving a heap of money as buying disposable nappies and disposable training pants for at least two and a half years soon adds up to somewhere in the thousands, especially if you have more than one child. I loved using washable nappies, it wasn’t a hassle in the slightest – it was just a case of putting everything in the washing machine and then hanging it up to dry. No late night dashes in the rain to the shops to buy nappies because we’d ran out, or carrying home bulky packs of nappies, or stinky bins full of discarded nappies – we just put a wash on every time we started to run low. So convenient! Now that we’re at the toddler stage, we’ve got to the point that whenever we go to the shop my daughter asks for a little plastic pocket money toy. The thing is 9 times out of 10 the toy lasts two minutes before a) she gets bored of them and b) they break or get lost down the back of the sofa. This means you end up with a mountain of plastic rubbish. Instead, say no – this saves plastic and saves you money. At the moment I find promising a trip to the park instead works miracles at diffusing a fraught temper, or perhaps a snack! I recently bought my daughter’s bed secondhand, and try and buy secondhand clothes as much as possible, either in charity shops or through eBay (some eBay top tips here!). Children grow so quickly and things like clothes may only be worn a few times before being given to the charity shop or sold online. It helps stop perfectly fine items going to landfill and saves money. 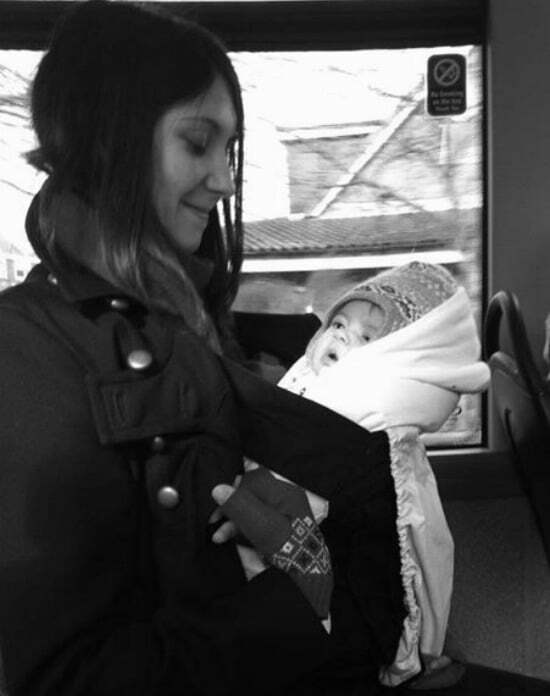 Getting about with my daughter on the bus, in the Ergo baby carrier ( 7 weeks). 5. Do You Need a Car? Cars are expensive. You buy a car, you have to insure it, you have to pay vehicle excise duty, you have to pay for fuel and oil, you have to pay for replacement tyres, you have to pay for repairs, you have to pay it’s yearly MOT, you have to pay for parking, you may have to pay to park your car outside your house. And then it depreciates in value. On top of that they’re bad for the environment. Even though we live fairly rurally, with access to very limited local amenities, we don’t have a car. Kids are fairly portable – up until the age of 18 months I predominantly used our Ergobaby carrier* to get about (absolutely invaluable if you travel mainly on buses). With baby carriers or slings you can go anywhere and don’t have to worry about there not being a space on the bus for your pram. Now my daughter’s older and mostly walking, though still in need of a nap, I use a small umbrella buggy that folds up at the flick of a lever for quick and easy bus access. This works for us as I do most of my food shopping online (although I’m looking for ways to change this) so I don’t have to worry about carrying bags of shopping home and having to deal with toddler and folding a buggy. 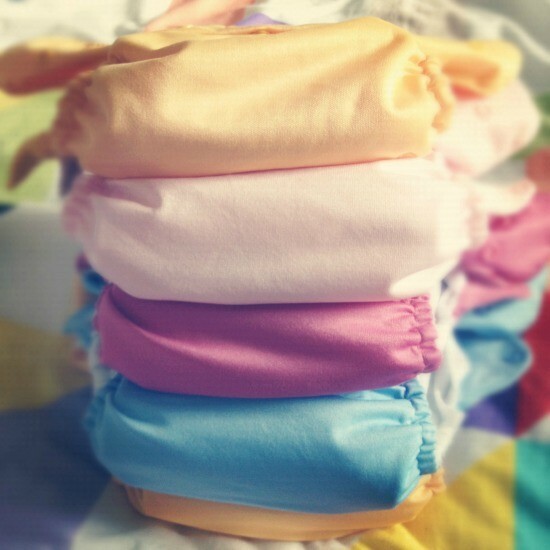 Using reusable nappies means I don’t have to carry bags of big bulky bags of nappies home either. Season tickets are often cheaper than paying for each trip individually. In Edinburgh you can get unlimited bus travel for £51 a month. Kids under five travel free. £51 is less than one whole tank of petrol, and you don’t have all the other car costs to worry about. I’m not going to lie, sometimes there have been inconsolable crying fits on the bus, much to the dismay of some passengers, which has been difficult. However, mostly it’s been fine, and I strongly believe that taking the bus has been good for us. I have made some really good friends on the bus that I wouldn’t have met whilst travelling alone in a car. My daughter is learning from a young age about acceptable behaviour on the bus. She’s also learning about how to interact with a wide range of different people, and about manners – without being prompted she always says “thank you” to the driver as we get off the bus! It also means we take advantage of all the great things happening locally – meaning we support our community and get to know our neighbours. Rather than driving to a softplay centre, I instead go to the toddler group in our village – my daughter gets to run around for two hours playing with other kids, and I get to meet local mums and dads. I shop in our local shop to supplement our fortnightly supermarket delivery. We spend a lot of time playing in the garden, so I know all of our neighbours now. If you’re not particularly into the idea of the bus, or aren’t quite ready to give up a car completely then there is another option. If you live in a large town or city you might have a car club near you. The City Car Club* is an amazing pay-per-hour UK wide car club, that I’ve used a lot for work. It costs from £4.95 an hour (that’s including fuel and everything! ), and is super convenient. You can even hire a car just by going up to a free one on the street, as long as it’s not booked out, for when you really need a car right that second! They even hire vans by the hour, for you know, if you have to pick up a Gumtree or eBay purchase, or are moving house! If you’re not a frequent car user, maybe just at the weekend say, then you’d probably save a heap of money ditching your car and joining a car club. We’re trying to eat as little processed food as possible – batch cooking instead. Chilis, soups, curries, dahls, pasta sauces, etc, you name it and it’s probably in our freezer, or the requisite parts are in our fridge ready to be cooked up! It’s not always that easy, especially after a long day at work, or a day of keeping a toddler entertained and keeping the house vaguely tidy, so we do slip up occasionally, especially when we’ve exhausted our supply of frozen meals. But batch cooking your own meals from scratch cuts down on food packaging, cuts costs and is healthier for you too. My partner and I are both long term vegetarians (no meat or fish for us). We don’t want to force our views on our daughter, and we’d rather she made her own mind up when she’s older, so a couple of times a week we’ll cook some meat or fish for her, which she eats alongside whatever we’re eating. It’s only once or twice a week: certainly not every day. Eating meat isn’t the best for the environment, and it’s expensive to buy, so even if you don’t want to go vegetarian completely, then cutting down on the number of days that you eat meat is a good approach. The Meat Free Monday twitter stream always has some good recipe suggestions if you’re struggling for ideas. As soon as we started introducing solid food to our daughter at six months old, we made a point of all eating the same things. 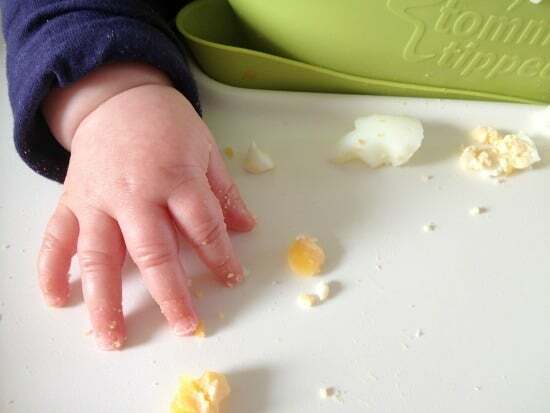 Up until the age of one babies shouldn’t have salt in their food (so no gravy, soy sauce or stock cubes), and honey should never be given to a baby under one in any form – cooked or uncooked. To get round this we either cooked one meal then seasoned our food separately, or cooked the same thing in separate pots, omitting salty items such as stock from our daughter’s pot. After the age of one it’s less of a problem, and as we cook a lot of our meals from scratch we know that there is not much salt in our food. As she has been introduced to most types of food from an early age, my daughter pretty much eats what we eat, with only a very few exceptions. Mexican bean chilli? Spicy lentil dahl? Vegetable curry and rice? All devoured in minutes. Pasta and garlic bread? Her favourite. This approach helps reduce food waste; leftovers easily become lunch; batch cooking saves time and money; and I don’t have to cook separate meals every night, also cutting costs. My daughter gets juice only as a special treat when we’re out. It’s sugary and bad for your teeth; it costs money; comes in plastic bottles or cartons; and has to be transported across the country. Water is free and comes from the tap. We don’t bother with expensive water filters or coolers, or any of that plastic stuff – just straight out of the tap for us. When compared to water in other countries, such as parts of Africa, the water is squeaky clean in the UK. 10. Do You Need A Big House? We currently live in a 1.5 bedroomed maisonette. We are currently looking to move to something a little bigger, but by bigger we mean maybe 2 bedrooms and a box room for my partner and I to work in, and pursue our hobbies in. We don’t need a four bedroomed house. Bigger houses need more furniture, and require more energy and money to heat. I always think it’s a bit daft to heat a big house that you don’t need. Living in a small space means you tend to acquire less junk! I hate it when you watch property programmes and the house hunters say they need a spare bedroom for guests. Unless you have overnight guests over every weekend othen you probably don’t need a guest bedroom. When we have guests over they sleep on our sofa bed in the living room, and when we say at someone’s house I don’t expect anything more than a sofa or an airbed on the living room floor. I love the Small & Cool posts on Apartment Therapy – such good inspiration for living small! Outdoor play is the best kind of play (18 months)! The last of my green parenting tips is to make all that you can. I’m not particularly crafty (I have my moments but I wouldn’t call myself a crafting wizard) so I don’t make my own clothes or anything like that, but something I am good at is making our own fun without having to resort to buying plastic toys. A walk in the park, jumping in puddles (a particular favourite), a walk along the beach, animal spotting, feeding the ducks, making things from junk, etc, are all fun things to do with your kids that don’t require making any purchases. Your child also benefits from spending quality time with you and having fun experiences. Hattie at Free Your Kids has a ton of good ideas in her archive of how to make your own fun with kids. 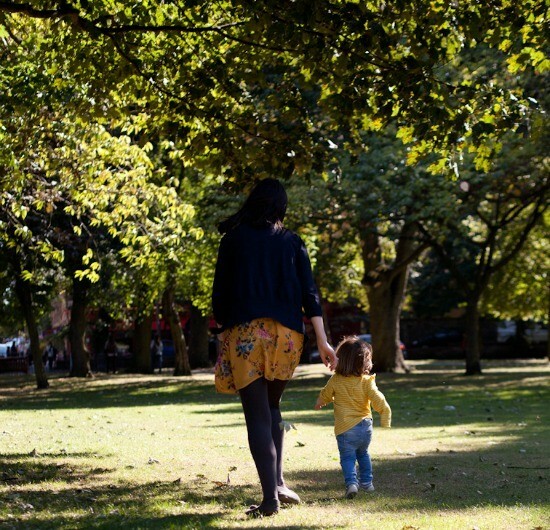 I’ve probably missed a load of ideas on how to be a green parent – share your green parenting tips in the comments below! * denotes an affiliate link. Please see my disclosure policy for more information. This is probably the biggest un-green thing I do. Quite often vegetables rot in the fridge, or leftovers which I haven’t frozen sit for longer than is fit for human consumption. Sometimes bread goes off in the bread bin. We used to get a weekly vegetable box delivered with local seasonal veg. We found however that we had no control over what vegetables we received so it was hard to plan meals in advance of receiving the box, so quite often things went off. We switched to fortnightly deliveries but even then we still found it hard so we cancelled our box. Now I buy seasonal British veg from Earthy in Edinburgh when we need it. Still, there’s been a single solitary leek in my fridge for longer than I care to admit…! There is a Tesco Metro beside my work. I quite often find myself popping in there for lunch and bits and pieces even though there are lots of little delicatessens and independent shops that really could do with the custom. Tesco is one of the evillest supermarkets, and I always hate myself for going in there. I should really stop giving them my custom – I think I’ll give it up during Climate Week and take it from there! To be fair on myself, I’m pretty good at not using the tumble dryer in spring and summer (unless we’ve had a spell of terrible weather). However, come autumn and winter it seems like my tumble dryer is never off. With a baby, and two adults we seem to generate a lot of dirty washing. Our house is very small and there isn’t a lot of room for clothes horses. I’ve rammed our tiny kitchen with as many clothes horses it can hold (to the point where we get tangled in them!) but still there isn’t enough drying space, so unfortunately the tumble dryer has to go on. It’s A rated, but it still doesn’t ease my guilt. If we had a garage or porch I’d dry clothes in there, but alas we do not. I’ve tried drying my clothes outside in winter, but living in Scotland, they often come back in just as damp as they went out. I’m not sure what the solution is here to be honest. If my phone is low on battery (which it often is – these pesky smartphones with zero battery life) I’ll plug it in and charge it overnight. This means that when it has finished charging it’s still switched on and using electricity. I really should get into the habit of charging it during the day so that I can see when the battery is full and switch off the plug as soon as it’s done but I always seem to forget until bedtime. What could you do better? Let me know in the comments below – I promise we won’t judge and you’ll feel better for sharing! And are you doing anything for Climate Week? You can also follow along with Climate Week on the #climateweek twitter hashtag.